Folks don’t seem to be taking our cleaning products seriously — or at least not literally. We frequently receive questions asking if the All-Purpose Cleaner, or APC as we like to call it, is safe to use on real wood, or if it’s meant to be a glass cleaner, or how it does with car grease, etc. Let this serve as the official answer to all of the above: Yes. Here are all of the ways you can put the All-Purpose Cleaner to work to fight household dust, grease, and grime. You have to have a chemically-nauseating, mildew-eating, bathroom-specific cleaner for the toilet and shower, right? Wrong. Our products don’t discriminate against kitchen grime or bathroom grime. They eliminate it all. Work from the sink to the toilet to the shower, spraying each and letting the product sit for about ten minutes, then re-wet and wipe. 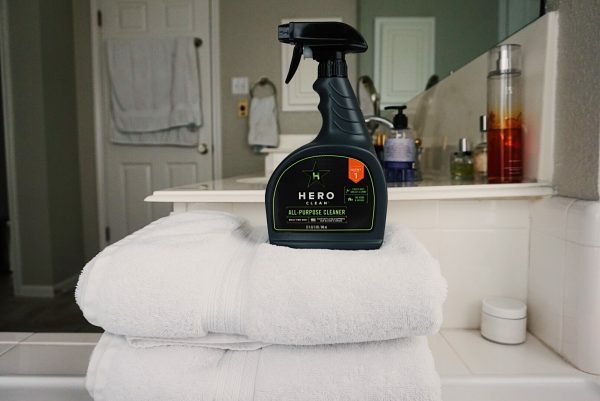 The added beauty of using this product in the bathroom is that it contains our Odor Defeater™ Technology, which is specifically engineered to neutralize odor at the source by creating a barrier around it. To add to your peace of mind, the All-Purpose Cleaner is sugar based, rather than toxic sludge based. The Juniper scent is clean and fresh. We decided to leave out notes of toxic chemical, or worse, overpowering floral. If your garage is crammed from top to bottom with god knows what from the early 2000’s, then this section probably isn’t for you. However, if your garage houses precious items like a grill, toolkit, two-tier dumbbell set, or a fine ride… let’s talk. The All-Purpose Cleaner should be your go-to to remove sweat, grease, or dust from each of your treasured possessions. With our low-streak formula, there will be no cloudy residue left behind on any surface. Meaning you won’t feel a film after cleaning, but you will see your reflection in any chrome rims you have going on. You can also use the APC on the interior of your muscle car, or minivan. One bottle does it all. Although, you may way want to purchase three so that you can put a bottle in each space in order to remind yourself to actually clean. Suddenly, you’ll find that you have more room under the kitchen sink than you’ll know what to do with. If you just can’t seem to stop hoarding ill-performing products, here are some ways you can make it seem like you have it all under control: How to Organize Under the Kitchen Sink. Really I love the Juniper smell which actually lingers for weeks. I use it and keep two Hero sprays in our motorhome primarily to spray on the upholstery and carpet. Last year I spilled a half gallon of milk which turned into a sour smell on the carpet. Spraying the Hero odor eliminate with enzymes ate up the smell and never returned! Now I use it as maintenance to keep the camper crisp and clean !